Finally, a normal week for the first time this year! I feel so much better! Today, I want to share with you my Design Team project for Challenge #11 of Scrapping 4 Fun Challenges. The challenge for this week was to create something with a Monogram in it. I used an old canvas picture, that I found in the trash, which I painted with white spray paint first, then used the DCWV It's all about the boys robots paper for the background. 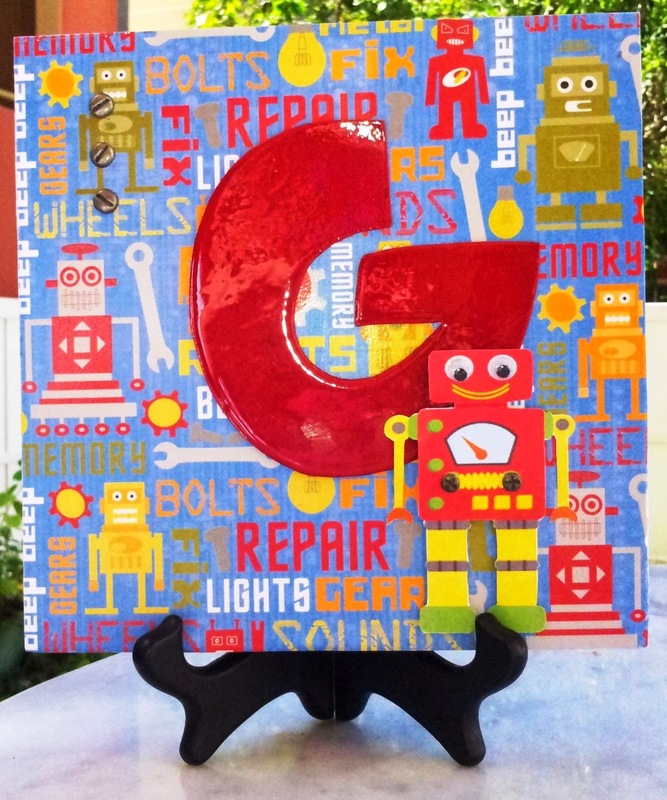 For the Monogram, I printed the letter "G" using the CK Silly Simon font, and then cut it out from a cookie carton and painted it with red apple acrylic paint. To make it shiny, I covered the monogram with Glossy Accents. The robot is a printable I found in the Creative Market page, which I printed and cut out. I added googly eyes and some nuts brads to it. On the top left corner, I added some flat head nuts brads as well. Well, hope you like my Monogram project! Head on over to Scrapping 4 Fun Challenges and show me what you can do with Monograms. What a create Canvas you have created. Love the bright colors!